I'm always the person who can't think of a way to help someone without being pushy or awkward until well after the need for help passes. 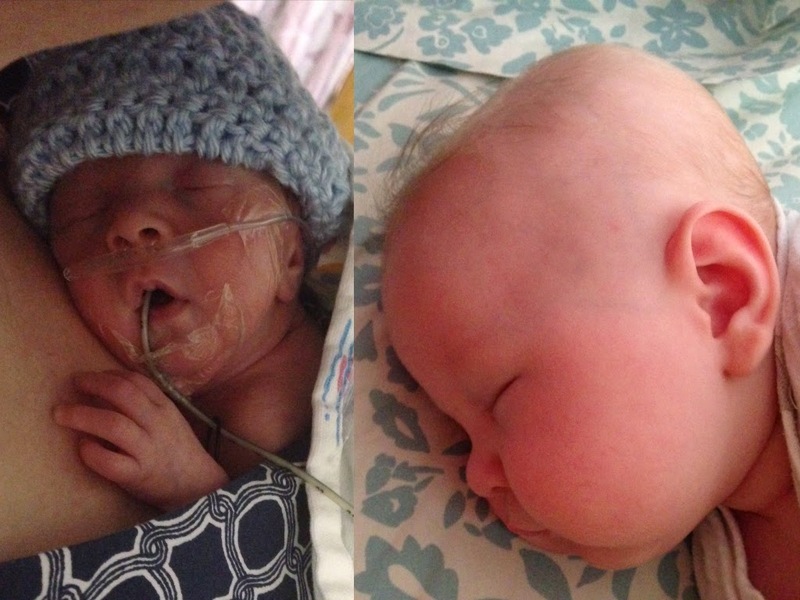 Surely I can't be the only one, so I thought I'd share some of the things that were most helpful during my stint as a NICU mom. Some of them are things you can do to help out and some of them are recommendations that might be helpful if you or a friend find themselves in a similar situation. Let's get the obvious out of the way first, shall we? Meals are the go to for any crisis really. Know someone having a rough go, bring them a dinner. Toddler having a meltdown to end all meltdowns? Chances are a cookie will fix it...unless of course the meltdown was due to a cookie related request. With a baby to be with in the hospital, I couldn't guarantee if or when I'd be home when people dropped off meals. And even if I was home, chances are, I'd be pumping and unable to answer the door. A cooler by the back door solved that problem. As much as I would have liked to thank the meal-givers face to face, I really appreciated that they understood our circumstances. The other very helpful meals were a collection of gift cards. The lovely folks at Mark's work gave us a basket filled with restaurant gift cards. They did their homework and all the gift cards were to places either very close to the hospital, or on our way there. They also gave us a nice variety of gift cards some were for grab n go eateries, and others were to more leisurely restaurants so we could mix it up. It was such a relief that the details of what's for dinner never kept us from spending more time with Isaac. You're going to want these. A primary nurse is a nurse who basically adopts your family. Every time they have a shift, they will be the nurse to take care of your baby. They'll also hand pick the nurse who takes over you baby's care once their shift ends (unless his other primary will be working that shift) Is there a nurse that clicks with you and has taken a particular shine to your baby? That's who you ask to primary. Neonatology is a highly specialized field, and particularly in larger metropolitan areas it's not always the case that your baby will have the same neonatologist for the entire duration of their hospital stay. For us, Isaac had a new neonatologist every two weeks--at the larger children's hospital in town the turnover is even more often than that. Some of the most frustrating times for us would be when a setback in Isaac's progress would coincide with a new doctor taking over his care. A primary nurse will be a constant for your baby and will guarantee consistency in his care, especially when his latest doctor hasn't gotten to know him yet. Having a primary nurse gives you a peace of mind in those moments when you can't be in the NICU because you know they will be a fierce advocate for your baby. They are your biggest cheerleaders in the NICU, their excitement at each milestone your baby reaches will be second only to yours. It's a relationship that you'll cherish even after you go home. Isaac's primary nurses are like honorary aunts and we still keep in touch. 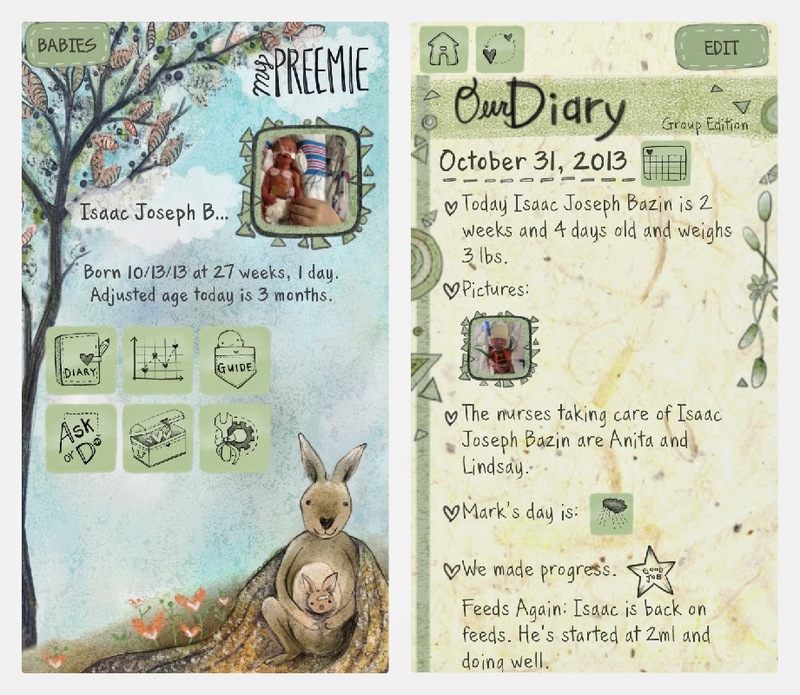 There are lots of preemie apps out there, and this one isn't free but it's our favorite. 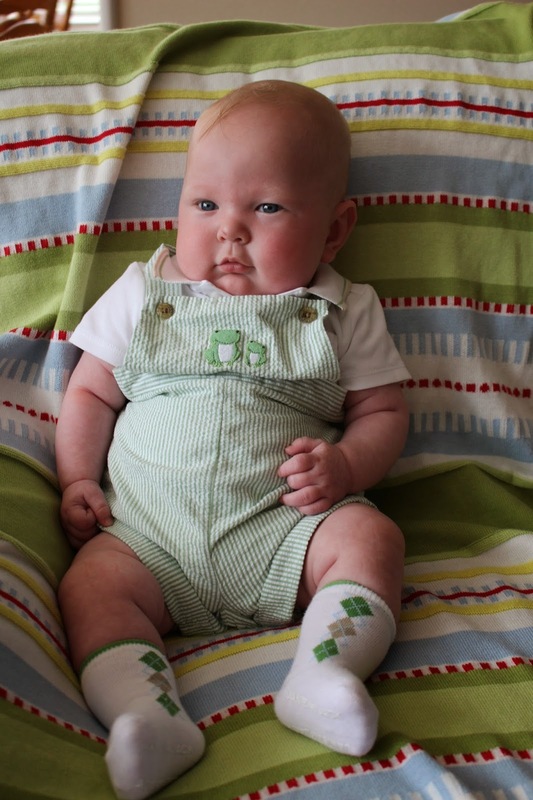 There's a section to record your baby's daily weight and weekly length. It has a glossary of terms with a handy *ask my nurse* feature where you can add anything you have a question about to a growing list the app saves for you. Best of all there is a journaling section. Mark was our primary scribe and I love having a day by day account of the tiny triumphs and setbacks that made up those 10 weeks. And when all is said and done, you can turn your journal into a pdf so it's not stuck on your phone forever. Our nurses thought the app was so cool they recommended it to other NICU families; that's high praise. This is a many faceted one. Isaac was born via c-section, lots of preemies are, and while my doctor finagled 4 days instead of 3 at the hospital for me, Mark still had to go back to work before I was ready to drive. Enter my mom, who flew in the day before Mark returned to work and chauffeured me around until I had healed well enough to manage on my own. Not every mom is able to save the day like that, so maybe you, kind friend, could offer rides to the hospital. And then there's parking. The parking situations at every hospital, varied though they may be, have one thing in common: they aren't free. We were at a smaller hospital, so luckily it wasn't as exorbitant as it could have been. There was reasonably priced street parking right next to the hospital with lengthy time limits. Houston has adopted an online parking meter system, so all we needed was a Park Mobile app and I was able to park for less than $2 a day. But had we been in the monstrously sized children's hospital in the medical center, we could easily have racked up $30+ a day. Rides would be extremely helpful in that situation, or, some hospitals use pre-paid tokens, that would be a much appreciated gift you could pick up for a friend who is making multiple hospital trips in a day. How many times have things been crashing down around you, say around 5 pm, as dinner burns, the dog yowls, the children scream and your husband wants to know what he can do to help? Offers of "let me know if there's anything I can do..." while genuine and heartfelt are a little bit like this. There are a million things that would help, if only you could collect your thoughts for a tiny bit and actually communicate what would be helpful to another human being. "Can I pick up your dry cleaning?" "Give me your grocery list" things like that are very much appreciated. I think we hesitate about getting too specific in our offers of help because we want our help to be perfectly suited to the tastes of the other person. Trust me. No one's going to complain if the shirts have too much starch or milk is the wrong brand, they'll just be grateful at what loving and thoughtful friends they have. *there are far more exhaustive lists in the vast expanse of the internet and I didn't even touch on the ways you can help if there are other children at home! Go visit Hallie for more favorites. But before that let's marvel at the change in Isaac one more time, shall we? Great advice Anne. So glad to see Isaac thriving! I wish we'd had primary nurses. Our neonatologists rotated every 3 days. We had regular nurses, but they rotated frequently to keep fresh eyes on the babies. In that situation, I highly recommend using the white board by the crib. That way we could communicate with the doctors and nurses when absent (e.g. preferred diaper rash care), outline the feeding schedule (nursing vs. gavache vs. bottle), give notice of expected additional visitors (grandparents liked to take the late night shift), and most importantly, daily stats (weight, diapers, feeding amounts etc.). Given the caseloads, lots of the little details that are super important to parents (like nursing attempts and bath nights) are often overlooked by medical professional. The whiteboard clearly showed all care givers the nutshell of our baby. The cheeks! And the hair fluff! Great info... Thanks for sharing! Oh my goodness! Those cheeks! I just want to eat him up!